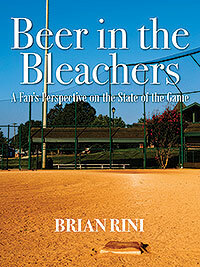 Brian Rini’s “Beer in the Bleachers” examines various facets of America’s Pastime including attendance, stadium design, and the much debated topic of the Hall of Fame. Bold and intriguing arguments are made on the topics of statistical analysis and strategy. Unorthodox tactics and elements are presented which could revolutionize the game if implemented. It is the voice of an educated and opinionated fan. Next Next post: Go Big, or Go Home—With 100% of Your Royalties.